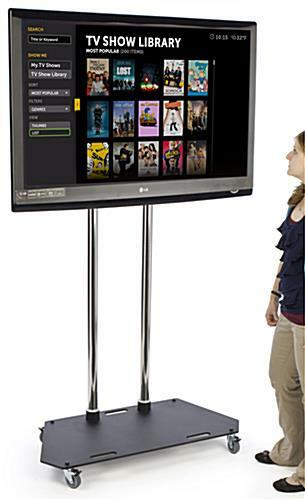 Bulk Monitor Stand for 55" LED TVs Online at Cheap Wholesale Prices! This Monitor Stand Supports Over 150 lbs! Buy Online Today! 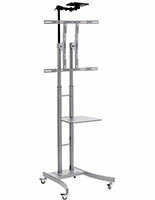 Heavy duty base of mobile TV stand is heavy to support television. Locking wheels stabilize flat panel display once in a desired location. 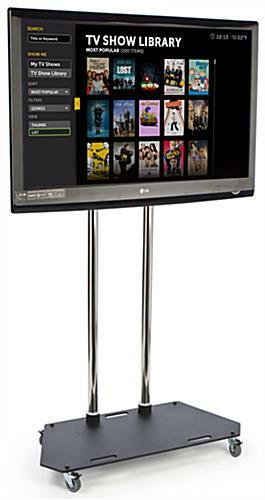 Mobile TV stand holds 37"-60" plasma, LCD, or LED television, weighing up to 176 lbs. Industrial strength unit ideal for use at trade shows! 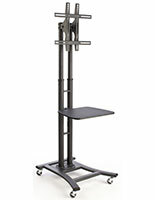 The monitor stand that is height adjustable features a VESA compatible bracket that is engineered for many television brands including Toshiba and NEC. 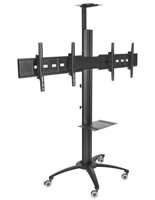 This flat screen mount holds a 37"-60" plasma, LCD, or LED television that weighs up to 176 lbs. This monitor stand with a black and chrome finish brings a sense of style to any location. 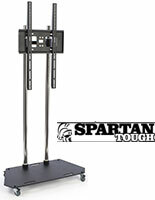 These adjustable television stands have the necessary hardware to mount your monitor onto the unit. 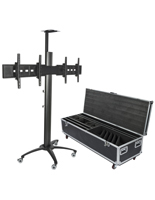 The flat panel plasma display ships unassembled, and includes instructions and tools for easy assembly. 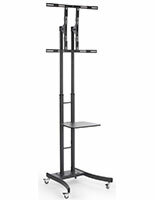 The cheap monitor stand with bracket for 37"-60" LCD TVs and smaller is heavy duty and includes a solid steel base for extreme durability. The high quality flat screen display is used at trade shows for conveying your company message to passersby. This heavy duty monitor stand has lockable wheels that allow users to easily move the stand between rooms & furniture for events. Each wheel can be locked once in a desired location to keep the monitor stand in one place. This flat panel television mount, monitor stand with wheels is constructed from high quality materials to last for many years. The overall design of the plasma displays lends itself well to many different locations. 31.5" x 19.8" x 1.0"